Biden sets stakes for 2020, Trump's power play, avowed racist executed for 1998 hate crime. Read the Morning Rundown. New York City Fire Department first responder Trudy Bermudez proposed to her girlfriend, FDNY paramedic Tayreen Bonilla, at Sunday’s pride parade. The 48th annual New York City Pride March boasted a sea of rainbow pride flags, neon wigs, body glitter and colorful floats, but two first responders from the New York City Fire Department turned heads in simple, navy blue uniforms. 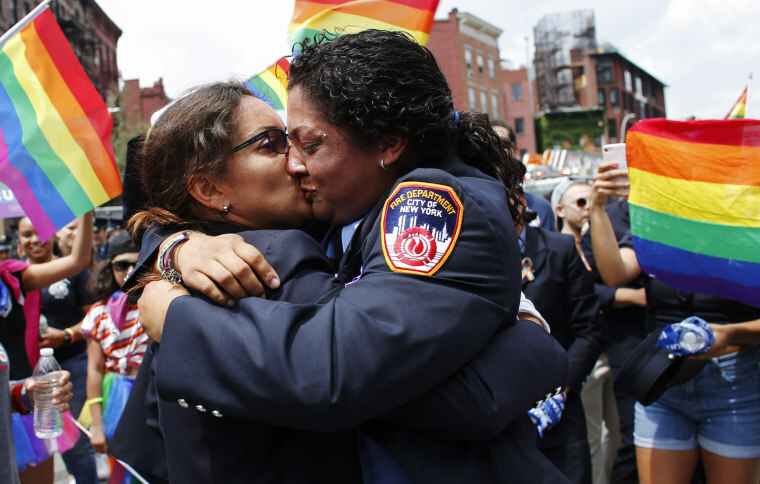 In the midst of Sunday’s parade — which included tens of thousands of participants and an estimated 2 million onlookers — Trudy Bermudez, an FDNY emergency medical technician, proposed to her girlfriend, FDNY paramedic Tayreen Bonilla. Bermudez said neither she nor Bonilla had ever marched in the parade before she decided to pop the question in the midst of a crosswalk a few yards away from the historic Stonewall Inn. “We learned that the fire department actually takes part and marches, and we were like, ‘Oh wow, that’s interesting. We should probably take part and support,’” Bermudez told NBC News. Bermudez said she had been thinking about proposing to Bonilla for the past six months, and after the couple decided to participate in the march, she thought the annual LGBTQ-rights celebration would be the perfect opportunity. Bermudez said she had planned to propose near the judges’ booth, which was toward the middle of the parade route on Fifth Avenue and 8th Street, where a friend was waiting to take photos. However, once they approached the Stonewall Inn — the site of the 1969 Stonewall riots, which launched the modern-day LGBTQ-rights movement — Bermudez said she couldn’t wait any longer. Bermudez said Bonilla walked cluelessly behind FDNY Commissioner Daniel A. Nigro as Bermudez fumbled for the engagement ring. “My glove got stuck in my jacket, and I couldn’t get the ring out,” Bermudez recalled. Luckily, Bonilla wasn’t paying attention and didn’t notice Bermudez fumbling in her pocket. When she finally managed to get the ring out of her pocket and presented it to Bonilla, Bonilla thought she was joking. “She kind of looked at me, and I believe she said, ‘No, you’re not,’” Bermudez recalled. Bonilla had good reason to suspect Bermudez was playing a trick on her. In April of last year, when the two women were being honored for saving the life of a fellow first responder, Bermudez did joke about proposing. But Sunday’s proposal wasn’t just a test run. It was the real thing. Bermudez got down on one knee to propose, and Bonilla bent down to kiss her and said “yes.” Their FDNY colleagues surrounded them and swirled rainbow flags in the air to celebrate. Bermudez and Bonilla have worked together at the FDNY for more than four years, and they started dating a year and a half ago. In addition to their upcoming marriage, they also said they’re looking forward to buying their first house together.